With the Celtic New Year (otherwise known as Halloween) having just passed, we wanted to take a moment to reflect and acknowledge what an incredible year we have had here at Shakespeare Republic … actually, an incredible two and a half years, to be exact. 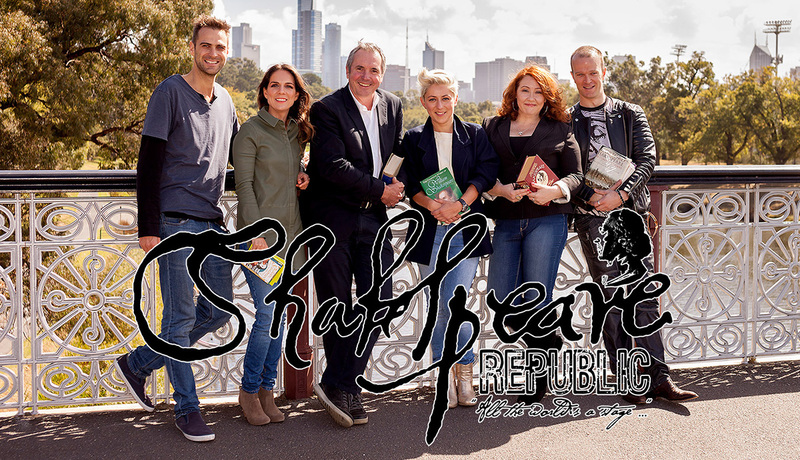 PICTURED (L-R): Shakespeare Republic Season One Cast: Ben Steel, Michala Banas, Alan Fletcher, Rowena Hutson, Sally McLean and Billy Smedley. Photo by Yanni Dellaportas. 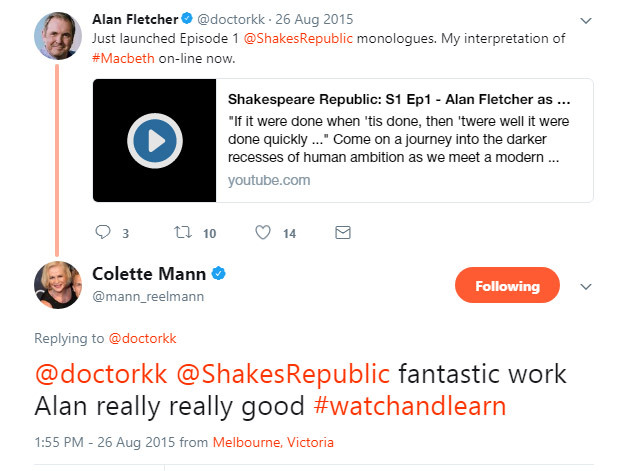 When Republic creator, Sally McLean had the brainwave back in December 2014 to take her love of Shakespeare and her interest in the burgeoning world of web series and combine the two, little did she know where that would lead. A few phone calls later and she found herself at the helm of what she still fondly calls “The Experiment”. 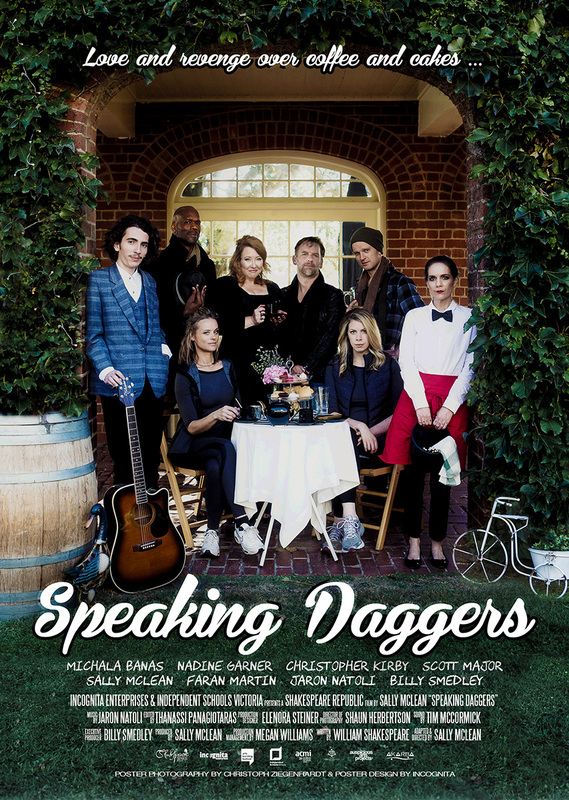 By April of 2015, she had her Season One cast lined up and they convened on the banks of the Yarra River in Melbourne to chat to camera about Shakespeare, this new thing called Shakespeare Republic and what their hopes and fears were about the work they were about to undertake. From that day, a series of videos (shot by Yanni Dellaportas with additional footage by Ben Steel) were created of these interviews, which are still available on YouTube, under the playlist title “Musing on the Bard”. Over the next few months, Sally and the team filmed the six episodes of Season One. It was a crazy ride and a huge learning curve, but somehow, on a budget of less than $1200, we did it. And we had a lot of fun in the process. We had no make up department, no production design or costume department, rarely had Unit Management, we just came up with the idea for the ep in rehearsal, then everyone pitched in with whatever was needed, cast and crew alike, to make it work. And, somehow, it did. 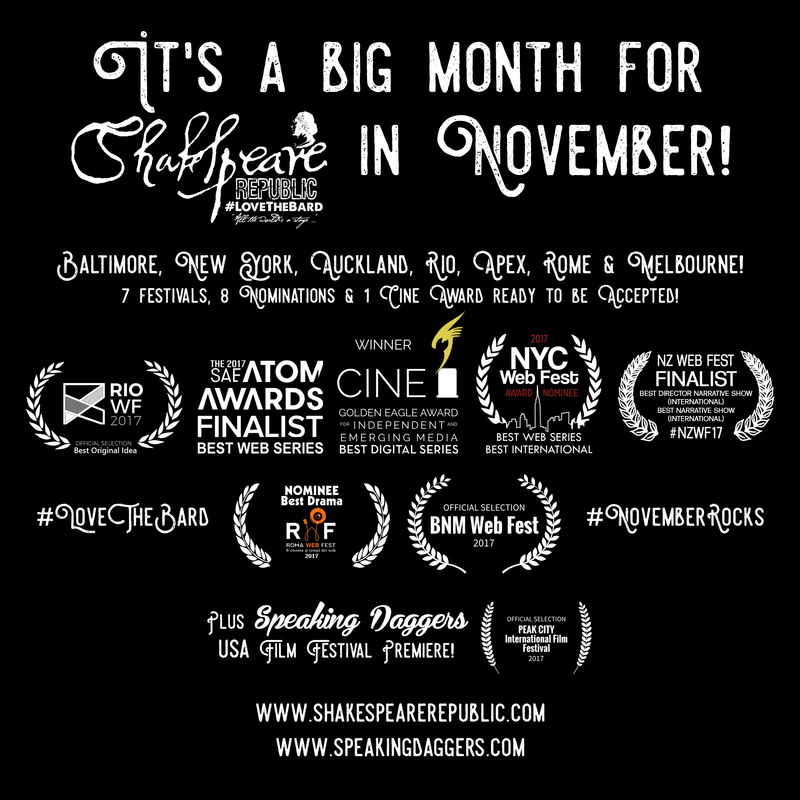 And so, on August 18, 2015 we officially launched Season One of Shakespeare Republic with our first sponsor for the series, The Courthouse Hotel North Melbourne, where we screened our official trailer and first episode and celebrated with our friends and colleagues from Melbourne’s theatre and film scene. By the time August 25 2015 rolled around, Season One had completed filming and began broadcasting, firstly on YouTube, then on Vimeo. In keeping with celebrating the fun being had, a series of behind the scenes videos were also released a few days after each episode. Because we didn’t have a dedicated Behind The Scenes camera person (the same issue we had for Season Two), it meant that various cast and crew members filmed on their phones or the spare production camera when they could, but they still managed to get some gold and capture the general mayhem caused by having usually no more than three crew on set, including the director! To see all the Behind The Scenes Videos from Season One, go here. Once the series was finished and released, the festival circuit was discovered. 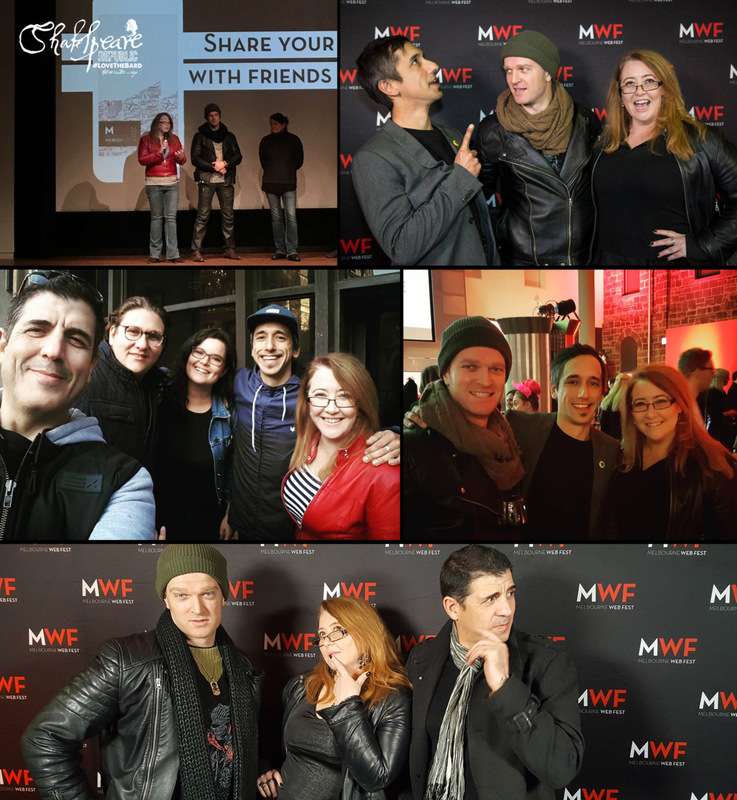 There were festivals dedicated solely to web series! And many other festivals who were now including web series in their line up! Game on! And so the festival submission process began. 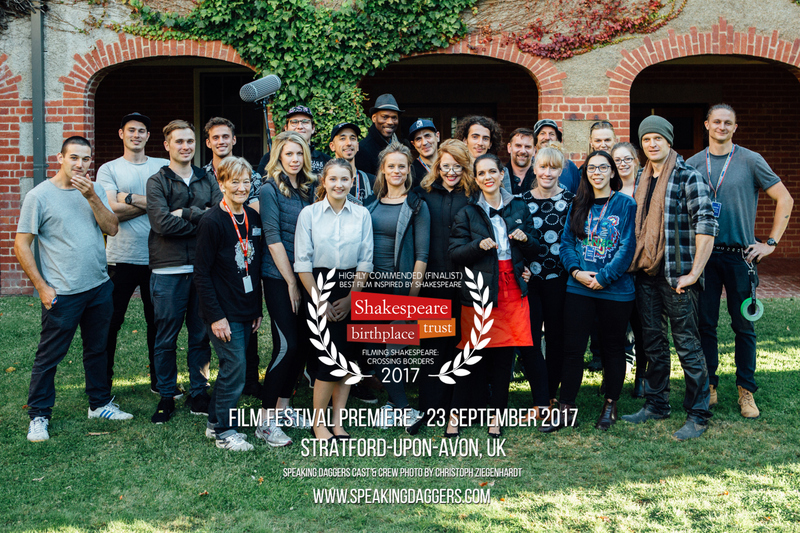 Beginning in October 2015 and concluding in October this year (2017), Shakespeare Republic Season One had a truly impressive festival run for a wholly independent, no-budget series – officially selected for 31 international film and web festivals, receiving 12 nominations and 9 awards. This also included being officially selected for Melbourne WebFest (in the Spotlight selection), the International Online WebFest (with a nomination for Ben Steel for Best Actor) and Dublin WebFest (with a nomination for Michala Banas for Best Actress, Comedy). Fired up with new ideas and some ambitious expansion plans, Season Two began taking form early-2016. A few more phone calls and meetings and our cast expanded from 6 to 13. Rowena Hutson got busy with her own amazing one-woman theatre shows, which saw her touring Australia and the world, but also meant that sadly, she wasn’t available for the next season. Ben Steel began work on his own screen project, a documentary on mental health, which also meant he was no longer available to take on another round. Both Rowena and Ben remain members of the ensemble, despite not being part of Season Two. Some of the 13 cast of Season Two – L-R: Billy Smedley, Wahibe Moussa, Michala Banas, Alan Fletcher, Christopher Kirby, Sally McLean, Shane Savage, Nadine Garner, Phoebe Anne Taylor, Falon Ryan and Stephen Costan at the launch for Season Two. Photo by Cate O’Connor. By the time April 2016 rolled around we had our line up of actors: Michala Banas, Stephen Costan, Alan Fletcher, Nadine Garner, Dean Haglund, Christopher Kirby, Sally McLean, Tariro Mavondo, Wahibe Moussa, Falon Ryan, Shane Savage, Billy Smedley and Phoebe Anne Taylor. But we also needed to raise some cash to try and make our lofty ideas for Season Two possible. We may have made Season One on the smell of an oily rag and the good graces of our cast and crew, but we needed something more in the kitty to achieve everything we had in mind this next time around. We were delighted to not only reach our target via crowdfunding at the Australian Cultural Fund, but explode through it to raise 123% of our total amount! We love all our donors and supporters for making this possible! Our of our crowdfunding rounds for Season Two, we also gained a new Executive Producer in Robina Bamforth and an Associate Producer in Stephen Wyley, both huge supporters of the work and fabulous humans that we were delighted to welcome to the team. We also took the step of being auspiced by Auspicious Arts Projects, who took over budget management, insurances and some of our legals and Megan Williams from Auspicious joined us as Production Manager (and she is a god-send that we are so grateful to have backing us up!) Lena McMurray also joined the team taking care of us at Auspicious and we can’t sing these ladies praises highly enough! June 2016 rolled around and we began formally announcing cast members via the release of a few fun videos introducing the new team members, including Dean Haglund Page and Christopher Kirby. And then, it was onto filming. We shot 13 episodes in 10 days in two blocks – one 2 day block in August and an 8 day block in September 2016. We don’t know how we got through it in one piece, again we did it on a tiny budget and the good graces of our cast and crew and with some wonderful support from our wonderful sponsors – The Courthouse Hotel, North Melbourne and our location sponsors, Lord Somers Camp and Power House, St Catherine’s School, Melbourne and Toorak College. We had a bigger crew – including an actual make up department and camera assistants and Unit Management and production assistants – but we still had to multitask and although we could pay everyone a token amount, it was still a token amount. Shaun Herbertson took over all cinematography responsibilities and filmed on his RED, Tim McCormick returned to run Sound, assisted by Abramo Peghini, and everyone pitched in and gave it their all and still managed to have fun, which was brilliant. We are so lucky with our team! hen it was into the edit. We didn’t just get some fantastic new people on set and on the screen, but also in Post Production. The brilliant Thanassi Panagiotaras joined the team and became co-Editor with Sally McLean, who happily handed over some of the workload! Thanassi is also a fantastic colourist and VFX Artist, so we definitely danced a jig when he agreed to come play with us! We thought we’d do something a bit different for Season Two’s launch, which happened in December 2016 – a live show performance of the work. Again, as Sally often points out, this is still “The Experiment” – and we wanted to see how it would work. It was also used as a fundraiser to help get some cash for the festival submissions we knew we had coming up, as well as covering some outstanding expenses from shooting. 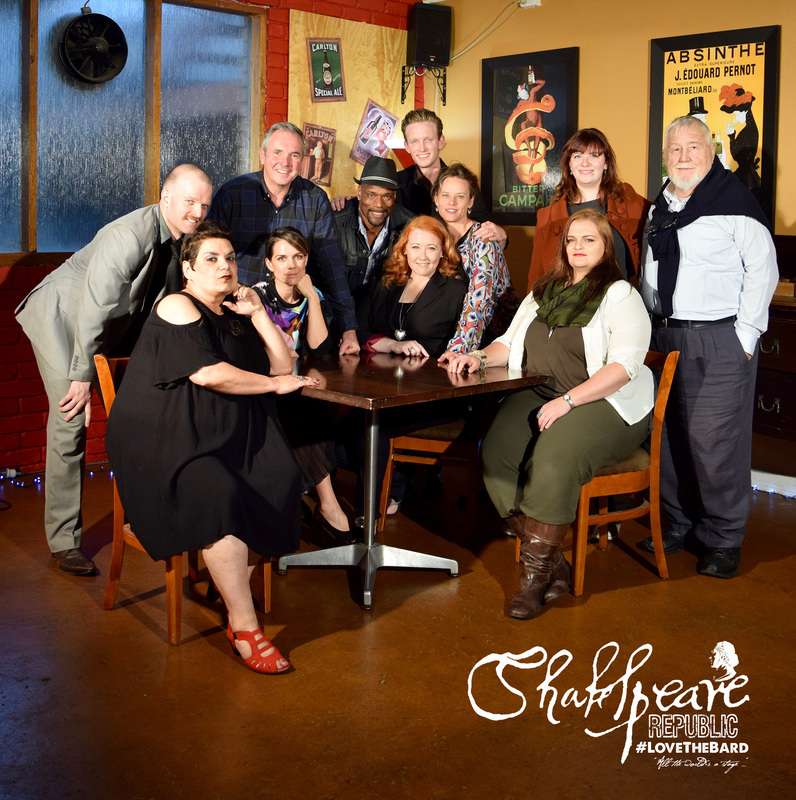 We returned to The Courthouse Hotel, North Melbourne, who again sponsored the evening, letting us take over the whole building to turn it into a Shakespeare wonderland for one night only. Paul Anthony Nelson kindly came back to film it for us and 9 of our 13 cast performed their monologues live as “installation theatre”. They were also joined by Co-Producer, Perri Cummings, who performed a piece as “Puck” (which gave a nod towards plans for Season Three). We were also delighted to welcome to the fold new sponsor, Mr Moto – Print & Distribution, who became our publicity sponsor for the event, putting our content on installation screens all over Melbourne and it’s suburbs for the two weeks leading up to the event, as well as distributing our flyers around Melbourne. We love our supporters and sponsors so much and couldn’t make this content without them! Come January 2017, Season Two was released into the wild. All episodes were released on Vimeo and YouTube and we dived back into submitting for the Festival circuit. In the meantime, we had been approached to create a stand-alone piece for the upcoming inaugural Arts Learning Festival to be screened at ACMI. The result of that was our first short film for the Republic, Speaking Daggers. Funded by Independent Schools Victoria, in conjunction with Incognita Enterprises, this meant we could pay people – although it also meant we could only have one day to film 11 screen minutes. We are somewhat crazy and somehow did it. The film was then launched at ACMI with a screening, followed by a Q&A with Sally as Director/Producer and the cast. We also shot our first Shakespeare music video – O, Mistress Mine – which formed the soundtrack to Speaking Daggers, composed and performed by the fabulous Jaron Natoli. That is now doing the festival circuit, making it’s festival debut at the Queen City Film Festival in the USA last month. And now it’s November 2017 and what a wild ride of a year it’s been! Shakespeare Republic has been doing amazing things this second time around. A lovely review in The Guardian, Sally being invited to speak on panels for Monash University and next year for Melbourne University, the series currently ranked at #15 on the Web Series World Cup and Season Two now officially selected for 26 international web and film festivals, with 27 nominations and 6 awards to date. 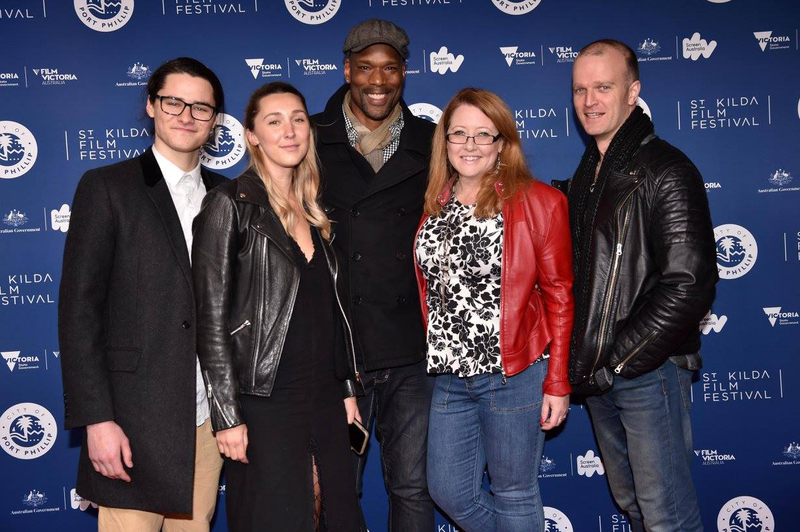 A major highlight for the team was getting selected for St Kilda Film Festival’s “Australia’s Favourite Web Series” showcase (which is by invitation), and then making official selection AND nominated for Best Australian Drama at Melbourne WebFest. And then winning the prestigious CINE Golden Eagle Award for Best Digital Series in their 60th year was AMAZING! That all happened in a very short space of time earlier this year and was amazing and like a whirlwind. Then getting officially selected (and in most cases also nominated) for Baja Web Fest 2017, Miami Web Fest, Tuscany Web Fest and Tuscany Film Festival, Sicily Web Fest, Austin WebFest, Bilbao Seriesland, Minnesota WebFest, Brooklyn Web Fest, UK Web Fest, NZ Web Fest, Baltimore Web Fest, Roma Web Fest, Rio WebFest and NYC Web Fest … Extraordinary!!! Being nominated for two awards at the International Academy of Web Television Awards this year was amazing, and we are so excited about being a Finalist for Best Web Series at the upcoming ATOM Awards in Melbourne at the end of the month. And winning Best Cinematography at Sicily, Best Hair & Make Up at Tuscany, Best Male Lead (Christopher Kirby) at Austin, the Special Jury Award at the Portugal International Film Festival, Best Ensemble (Ensemble Amets) at Bilbao Seriesland and of course, the CINE Award has just been unreal and so amazing and wonderful. 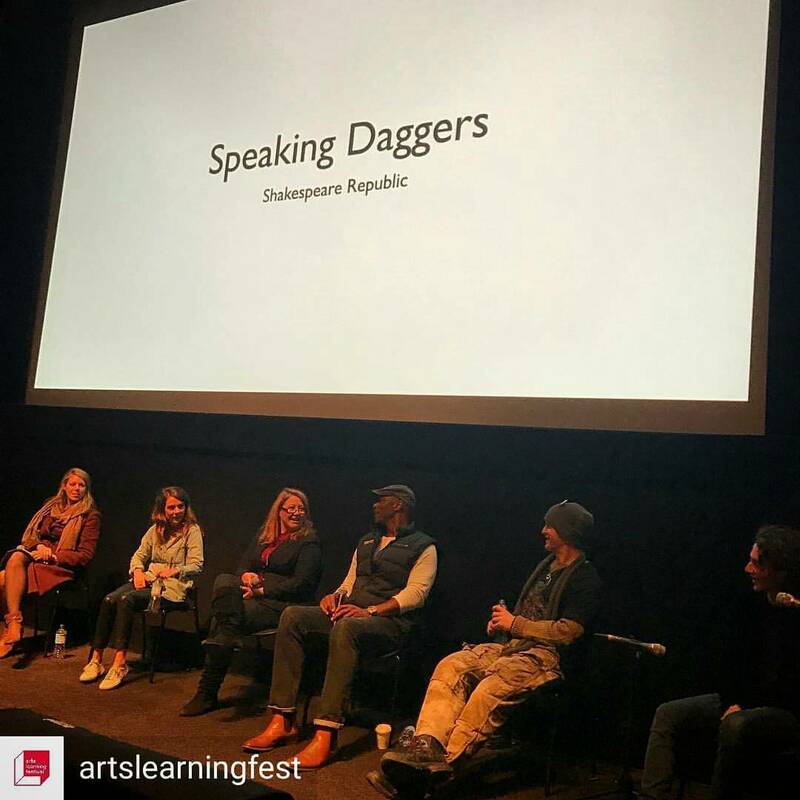 Speaking Daggers started it’s festival run in the best possible way – making Finalist level at the Shakespeare Birthplace Trust’s Shakespeare Film Festival and receiving a “Highly Commended” nod from Festival Jury President, Sir Kenneth Branagh. It has now been officially selected for the Peak City International Film Festival in North Carolina and the Anglicon Film Festival (which celebrates all things British TV). The film has been submitted to festivals right through to December next year, so hopefully there will be more screenings to announce over these next 12 months. While it’s been an extraordinary ride so far around the festival circuit, we haven’t really been able to be truly a part of it all as we are in Melbourne and most of these events take place in Europe, the UK or USA. That is what it is, but … in only a few days time, Sally and Billy will be getting on a plane and heading to NYC to attend the NYC WebFest and be presented with the CINE Golden Eagle Award in person – also in New York! They will also be attending the Peak City International Film Festival in North Carolina where Speaking Daggers has been officially selected. So it’s going to be a busy, but hugely fun trip! We have already begun work on Season Three of Shakespeare Republic, #GodsAndMonsters. Ideas are being discussed and it will be different from, and bigger than Season Two, yet still rooted firmly in our core philosophy of making Shakespeare accessible. The producing team for Season Three is already taking shape – Sally McLean and Billy Smedley are being joined by Christopher Kirby and Alan Fletcher to pull the series together and make it happen. Incognita Enterprises, the business behind Shakespeare Republic is also working on our sister series Till The Boys Come Home and a few other projects are in development. We begin the process now of finding a home for Shakespeare Republic Season Three and the funds to make it and we will keep you all posted as that progresses and as we can share the information publicly. Season Two will continue it’s tour on the festival circuit for a fair few months yet, so there’ll hopefully be more news to share on that front as decisions are made. Keep your fingers crossed for us! Rest assured, the adventure in Bardland continues and we thank you all from the bottom of our hearts for coming on the ride with us. Posted On 04/11/2017 in Uncategorized with 0 Comments.